There are four members in her family: her parents, her brother and she. The family's income stems from her father who is a fishmonger and construction worker (unstable) and her mother who raises ducks and chickens in a small scale at home. Her physical and mental health were fine upon enrollment. Yet, she was a little shy when her teacher asked her something about herself. 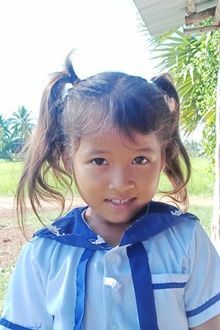 Kanika is selected through her enrollment in our community-based preschool. Every day, she is well taken care of. She has sufficient food to eat. However, she lacks in proper education. Tell your friends Kanika needs a sponsor!